Umbrellas have been in a traditional 8 panel round configuration for many decades now. 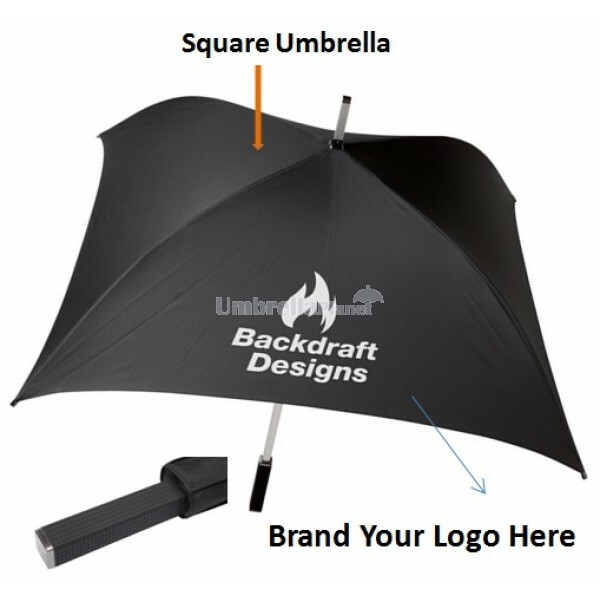 If you want to break free from tradition and have a truly unique umbrella that is personalized with your logo or graphic then this is the item for you. This is a square umbrella. When opened this umbrella features a unique skeleton design which enables it to have 4 panels, instead of the traditional 8. The result is a beautifully unique umbrella that is a square. To complete the design, the handle has been specifically moulded into a square shape too. When folded down this umbrella goes neatly into a square pouch. This is definitely a square umbrella that is not boring. This umbrella features an effective easy slide opening mechanism. To open or close, this umbrella will simply glide shut or glide open. You will be delighted at how well it opens. This umbrella features 4 large panels to brand your logo. Due to the fact that this umbrella only has 4 panels, the imprint area on each panel is especially large at 14x21cm. The displayed price includes a 1colour print of your logo onto 1 panel. A print set up of $75 applies customization. If only a jpeg is available, an artwork redraw fee of $20 will apply. We deliver this umbrella complete with personalized branding all around Australia direct to your address. The minimum order this style of umbrella is 50 pieces. We can assist with unbranded samples of the Square Custom Umbrellas, check out our detailed information on the sampling process and drop our friendly sales team a line!